Close to four million people in the US have glaucoma and possibly half of those do not know they have the second leading cause of blindness. Sadly, about 50% of visual function will be lost before they have any indication that something is wrong. Research by eye doctors has shown early diagnosis and treatment can be crucial in preventing blindness in later years. Treatment for glaucoma usually is done with prescription eye-drops used 1-2 times per days. Some more complicated cases of this eye disease will require minimally invasive LASER eye surgery, and in some cases more complex surgical procedures will be needed to bring the eye pressure under control. Damage to the eye occurs from inadequate circulation to the optic nerve and nerve fibers that supply the eye. This is typically due to elevated pressure inside the eye. 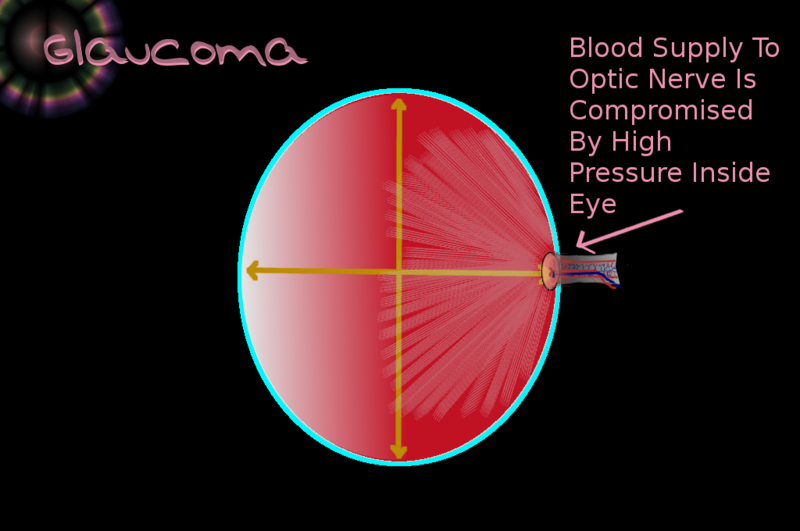 Measuring the intraocular pressure inside the eye is the most frequently used test in diagnosing glaucoma. Dilation of your eyes also allows your optometrist to examine the nerve head where it enters the eye for any signs of damage from glaucoma. Eye dilation of shows glaucoma damage before other methods. Measuring peripheral vision, or a visual field test, is the standard for documenting damage (or stability) over time. Newer technology allows detection of early loss of nerve fibers in the eye. The incidence of glaucoma starts to increase after age 40. Most glaucoma occurs in people that are 65+ years of age. African Americans are much more susceptible to glaucoma. People that smoke, have a history of diabetes or heart disease, and those with close relatives who do have glaucoma all have a higher risk of developing glaucoma. After age 40 it is important to start having regular screenings for glaucoma. There are differing opinions on how frequently you need to do this, often every 3-5 years. Since glaucoma can irreversibly damage eyesight in under a year it is advisable to have your eyes checked every 1-2 years. After age 60-65 it should be on an annual basis. Blindness is too high of a price to pay when it can be prevented in most cases. The National Eye Institute, National Institutes of Health, Prevent Blindness America, American Optometric Association, and the Glaucoma Research Foundation are all supporting Glaucoma Awareness month this January to help in the early diagnosis and treatment of glaucoma. If you have not has your eyes checked recently pick up the phone and call us today!